The view looking down from the same position of the previous picture. I don't know about you, but I'd love to see that out my bedroom window every morning. That's why we park the camper next to the bank when we camp. Waking up to see the steam rising from the creek and watching fish travel to fish work is very cool, and very relaxing. Wouldn't it be cool to build a deck that is partially situated on the hillside? I may be the only one who thinks that, but I figure if the wooden house has stood the test of time a properly engineered deck would withstand the elements. What do I know though? It's finally Friday and it's still really, really, and stupidly cold here. While I wouldn't reject a major snowstorm, I'm ready for spring. We're supposed to get snow showers this afternoon, but honestly, I haven't checked the forecast to know exactly what's going on. It does figure that I have to make a grocery run, as is my usual Friday chore. Tomorrow is my RWA chapter meeting. I'm really looking forward to it. But, of course, as is my absolute luck, K3's district pinewood derby race is also tomorrow. Bugger. That's all for now. And this concludes your brief foray into things I find interesting. For today. While I was looking through these pictures I came across a few more that will be coming up over the next few days. This is the last one...okay, maybe. 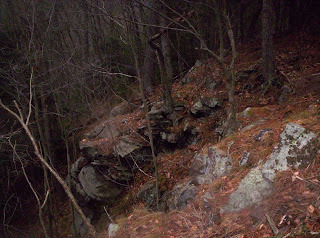 Taken from a small ledge on the drop off looking up. Very cool place to stand, unless you're afraid of heights, then I don't recommend it. What I love about this is the huge windows that face the creek below. Do you really think a nasty old guy would care if he could see the beauty of the water below? I prefer to think this was originally built as a starter home until the young couple could build their dream home on the surrounding property. Tragedy happened and the wife died, leaving him alone in the place that was to be the start of a beautiful future together. Of course, that's just my thinking. I'll have to try to find out what really happened. 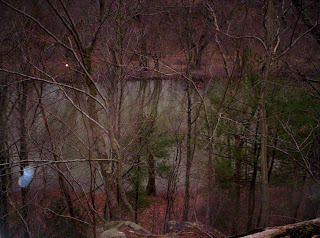 Come to think of it, I do have one more picture that shows the creek below. Since no one's yelling about my choice of posts yet, I'll see what I can do about putting it up tomorrow. Oh, and I have a short list of irritations today: It's cold. My computer is really stinking slow. It's really bitterly cold here. Come and talk to me, Misty Simon, and Vicky Burkholder TONIGHT! We'll be there talking about The Shape of Love, and whatever else you want to talk about. (within reason) Come on over and say Hi! 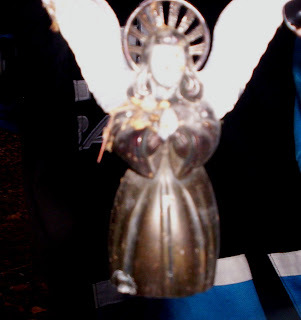 Picture quality is awful, but this Christmas angel totally intrigued me. She was whole. Perfect, and so tarnished her former angelic face took on a slight evil edge. We planned to take her back to my sisters house and take some decent pictures, but somehow, and none of us have any idea how it happened, one of her wings broke off. I kid you not, she looked totally different after that. Scary different. So, she went back home. And this very poor photograph is all that's left for you to see. Those black fingernails belong to my niece. She was not thrilled I made her hold it so I could take a picture. And, of course, I had to bring up that maybe the angel was cursed. Maybe she was the reason the cabin looked the way it did. Maybe she was some token of evil that caused the little house to slip toward the ravine, and maybe she destroyed the lives of those who'd lived there. You can imagine the enthusiasm in which my rambling was met with. Yeah. Still. You have to wonder. Or...maybe that's just me. I did find another picture from this particular weekend. I mentioned my sadness at not having any manure photographs from our Sunday adventure, and then I found the picture which I'll show you tomorrow. It's going to be great. Ha! Okay. This will be the last of the cabin photos for now. I'm sure you're not all finding it as interesting as I do, but I had to show you the clothes still hanging in the loft. It actually looks like there's some female clothes hanging there. I have three different ideas on this. One: a woman actually lived here. Two: they were the wife's clothes and he couldn't bear to get rid of them. Three: dude was a cross-dresser. Whatever - to each his own. I prefer option two because it's sad and romantic. I have one picture from our trek into the wild yesterday. No cows, or cute baby goats, or fuzzy baby chicks - just a window shot of an old covered bridge on the way. I realize how lame it is that I didn't take any more pictures than that. I, obviously, had the camera with me. I even made sure it had fresh batteries, and cleared all the obnoxious teenager pictures. Then again, you'd have to endure post after post of farm animals, dogs, mud, and maybe even some manure shots. Could be that it's a good thing I never got the camera out. Don't forget...Chat tomorrow night. See the sidebar. The Tuesday night chat in the Draumr chat room! See the info to the left, and don't be daunted by having to register first. I promise it'll be painless and worth it!! 8-10 pm EST - or as long as you want to stay and chat! And here's the cliff the cabin sits on. This is to the left, but you get the idea. Below is the creek. I'm not sure I have one that shows the drop, but I'll look. I have a few more cabin pictures, after that...who knows. We spent the day at our old neighbors from when we lived in the sticks. We haven't really seen these people in fourteen years except for a handful of times. Recently, we reconnected with them and decided to head up there to spend some time. The kids had a blast running around the farm - baby goats, little, fuzzy baby chickens, cows, horses and bigger goats. The only thing they said they didn't like was the smell in the barn. It was wonderful to be welcomed like no time had passed. There were no awkward silences, or continuous checking of the time to see if we'd been there long enough to leave. In fact, we left an hour after we'd planned to, and even then, we could have stayed longer. We'll definitely be going back and spending more time. That was my day. My shoes are muddy. I have mud on the back of my pants from the goats and there's a vague odor of cow on my coat, but what a good day. I hope your weekend was good. Even if you don't smell like cow. Wouldn't you just love to sift through all of that stuff to see what treasures are buried there? Okay, so maybe that's just me. Of course, I can't. It's not exactly safe to go inside, but that doesn't stop me from wanting to. The thing you have to remember is that this is located pretty much in the middle of nowhere. It's not like people can see it from any well traveled road. 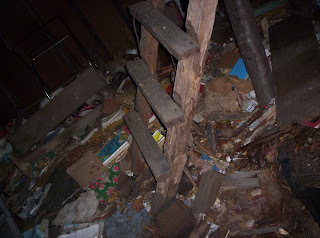 This mess is mainly from the shifting foundation and animal wreckage. I'll have to hike back up there in the summer and take another round of photos. Tomorrow, I'll show you the cliff. If I get time. If not, then it'll be Monday. 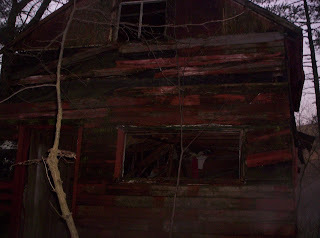 The front of the cabin. I know it's kind of hard to see. I couldn't seem to brighten it. Under that window on the bottom there's a wooden work bench. Bits of paper, wood, and clothing litter the top. The front door is to the left of the window. The window at the top is a loft where the clothing hangs and the sleeping area. There's a ladder to get there, which I'll show you tomorrow. I had a dream about this cabin last night, though now I can only remember vague images. The kids are off school today thanks to winter weather. There's a lot of noise in my house and a fair amount of clowing around. The weather totally blew my plans for today and that makes me sad. But I did get to sleep in, and have already taken care of much on my 'to do' list. Supernatural was awesome last night. Hendrickson's turn around was very well done. His death was sad, but I had a feeling that was going to happen. The creepy little girl with the white eyes at the end, however, was absolutely nothing I expected. Oh, and Sam and Dean's tattoo's...yeah...pretty darn nice. And I know I say it every week, but I loved the whole thing. I'm sad we have to wait so long for a new episode. But I converted a friend into fandom. She called me after it was over last night to tell me how much she loved it. That's always a cool thing. I totally forgot I had this picture to share. There are several more I'll put up in the days to come, but isn't this the coolest thing? 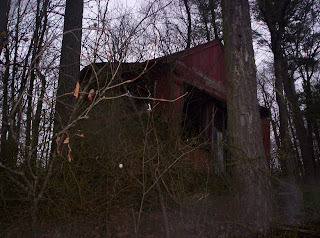 This little cabin, and yes, someone did live there, is near my sisters house. Actually, it's located on some property B and I would love to someday own. The view of the creek is spectacular and I have visions of a pretty house on the ledge with a deck overlooking the creek. Inside, you'll find the remnants of someone's life. 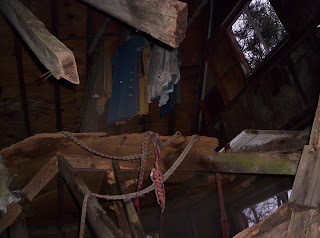 Clothing hangs from the rafters, books cover the tilted and unstable floor, Christmas decorations spill out of mostly decomposed boxes, and dishes are strewn both inside and out. 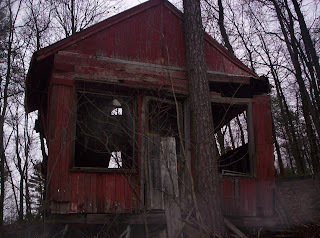 I'm not sure what happened to the person who used to live here, only that they haven't lived in the cabin for quite a while. See that tree? It's the only thing keeping it from tumbling down the embankment. How cool is that? It's impossible to go inside (though I won't tell you who did!). This is the view from the back. I'll show you the front, the cliff, and the creepiest Christmas ornament another day. Even the woods surrounding this old place seem to want to tell a story. I'm in awe every time we walk the land, and I always want to stay. We hiked here when my cousin was in, then trekked through the woods, before ending up at the creek. I hiked back then, while most everyone else went up yet another cliff, but only because I wasn't dressed for hiking and had given my sister-in-law my gloves because she didn't have a coat. More winter weather is supposedly on the way. Probably enough to totally screw up my fun plans for tomorrow, and force me to the grocery store today with the rest of the population of our town. Not fun. Don't forget...New Supernatural tonight...unfortunately, also the last new Supernatural for several weeks. I won't miss it. You shouldn't either!! This has been a weird week so far. Weird, but not necessarily bad. This morning I turned off my alarm because I thought it was Saturday. I've got the same kid who woke me with bodily fluids last week now dealing with upper respiratory symptoms. But even with it being an odd week, there's still not much to report. My truck had it's yearly physical and is now sporting some brand new shoes, which is good because it's snowing it's tail off here at the moment. Probably not enough to even delay school tomorrow, but we'll see. What else? Well, not much. Writing, chaos, more writing, more chaos...you get the picture. Speaking of pictures...I realize I haven't posted any on here for a little while. I did promise you one of our totem pole, but that might have to wait until we re-secure it. You kind of don't get the proper effect the way it looks now. I'll see what I can do in the photo department soon. When it's not snowing, there's not much pretty to take pictures of (unless you want to see the mud in my backyard), and if I do see something, I usually don't have my camera with me. Does anyone else think time is moving rather fast so far this year? In a little over a week, we'll be in another brand new month, and spring will be just around the corner. Yikes! Okay. Enough rambling for mid-week! Yep. That's it exactly. The kids were supposed to be off school today, but since the day was alternately scheduled as a snow make up day, they're in session. Except I have one under the weather child at home. I don't think it's ever going to end. Seriously. K2 is also home for now, but she's on her way to high school. Her arts school wasn't in session today, so she got a bonus sleep in morning. It's like 55* degrees outside, but supposed to be cooling off as the day progresses. Weird weather. My spell check button hasn't been working on my blogger page. I don't know what's up with that. I've been trying to take care of household administration duties today. Then, I realized the banks and post office are closed. So...I still have some phone calls to make relating to my switching phone services. We'll see how far I get with that. I'm not looking forward to it because I have this inkling it's not going to be as easy as it should be. I need a website. Our new ISP has a place where you can build "personal pages" for free, but it's not exactly what I'm looking for though I did mess around trying to build a site for a while. I'm not sure what I'm doing, but I'd like to figure it out soon. I'm kind of clueless as to how the whole thing works, so I'm going to be trying to figure that out in the very near future. Oh, the writing, you ask? Going well. I'm in the last third of the first draft of Out of the Shadows. I should finish by late this week, early next, then it's revision time. I should put the counter do-hickey thing back up, but since I'm nearly done I probably won't. That's enough rambling for my Monday. I seriously don't know! The day flew by and now it's late. I'm tired, but the brain is still too keyed up to even think about going to bed, even though I know I should. I was on my way and the phone rang. On my way again, phone rang again. Then, I realized I hadn't blogged yet, and here I am. The kids were off school today. I almost wrote 'this week' which is pretty much what it feels like since they only went 2 days. We had plans today, but what happened was fragmented, off time, and pretty much chaotic. But still good. Sam waking up every morning to Asia, the look on his face, and his growing desperation in knowing he was going to have to watch his brother die...again...was done so very well. There was so much to love about the episode. I can't even tell you all of it. The hug on Wednesday, the bullet wound, Bobby, the deep, dark, rough Sam. The whole thing was wonderful. And next week looks awesome as well. Then, we got nothing for a little while, which will pretty much kill me. Thank goodness for seasons 1 and 2 on DVD. Our weekend is pretty solid, but at least there's some fun stuff in there. An actual "grown up" night out with the gang to hear my brother-in-law's band. I can't tell you how long it's been since we've had one of those, and we're both really looking forward to it. Once you're tagged, you have to write a blog with ten (10) random things, facts, goals or habits about yourself. At the end, you choose ten (10) people to tag, listing their names and why you chose them. You also have to leave them a comment telling them "you're it," and instruct them to read your blog for instructions. The rules also state you can't tag a person who's already tagged you. 2. (borrowing from Nat a little) The S, M, and V keys are completely worn off on my keyboard. Soon A, D, N, E, and C will follow. This drives my family nuts, but makes no difference to me. On the laptop the N is fading and there's a definite wearing of the space bar. It's a good thing I don't need to see the keys to type because replacing the laptop keyboard...well, how easy or logical is that? 3. See #1. If I keep losing my connection it's going to take me days to finish this! Argh! 4. I was a Girl Scout for a very long time, but have very few memories of it. Well, except for the girl who was really freaked out by germs and would cry if she thought you touched something she was going to touch. And making tie-dye, though I don't remember what I made. 5. In high school and college I had perfect grades in grammar and english. By the time I started seriously writing, I couldn't remember most of the grammar rules (just ask my critique partners). It's taken quite a while, but I'm finally starting to remember them...well...all but that stinking apostrophe crap. 6. I wanted to be lots of different things when I "grew up". A graphic artist, a photographer, an archeologist, a nurse, a mom, a writer, an oceanographer, a marine biologist, and several others. Out of that list, I've managed 3. 7. Going from #6, besides being a mom, being a writer is the best job ever. It's also the hardest (besides being a mom). 8. I love to write creepy stuff. Really crazy villians and really odd scenarios. I'm not sure it's "dark", but out of my critique group, I probably write the darkest - or maybe that's "weirdest". I do like me some sarcasm and obnoxious behavior from my hero and heroine though. And there always has to be romance and a happy ending. 9. When I get into a good story, I will continue reading until it's done. I read pretty fast, too. I read the last Harry Potter in less than 36 hours. Yes, I skim, but I still absorb the words on the page and retain what I've read. My dad is the exact same way. 10. I get frustrated and irritated when my house is cluttered. I do like things neat and tidy, but with 6 people, the dog, and the cat living here, I've had to relax my standards or risk going insane and having no time to write. It's taken me a while, and it totally conflicts with my "supermom" syndrome, but now that the kids are older, I refuse to carry the burden of housekeeping alone. Guess what we're doing tomorrow on their day off school? I have to keep reminding myself of that, because today is a writing day for me and if I think too hard about the dust bunnies cohabitating under the kitchen table I'll be so annoyed I won't get anything done. So there you have it. Too much information, as usual. But hey! I didn't mention bodily fluids in this post! Again, I'm not tagging anyone because most of the people I know have already been tagged. 2. Very needy, not feeling well children. 4. Too many video games. 5. Laundry washed & dried with a red crayon. 6. Cartoons about male cows with udders. 7. A very long computer line. 8. Lots and lots of noise - most of it happy, but how much wrestling can I endure? 9. Not much writing done. Yes, we're actually getting some of the white stuff. They cancelled school before 6am this morning. There was a little snow on the ground, but not much. It didn't really start snowing until after 11am. By then, I'd cleaned up vomit, gone to the grocery store, cleaned up more vomit, and scratched my head at why they didn't at least let the kids go for a partial day. Doesn't matter. I would have had a kid home anyway. K2 is decidedly under the weather (obviously). That's what I woke to this morning. Then, it was the cat. But you probably didn't want to know about all the bodily fluids I cleaned up today. I haven't checked the forecast, so I don't know what's in store for tomorrow. It's actually a quiet evening around here since all activities were cancelled. Okay, not that quiet. Everyone is wound up, or they were, now that we're heading into the bedtime hour, things have settled down significantly. Thankfully. I spent the day fighting my virus protection - uninstalling, reinstalling, blah, blah, blah. I think I finally have it fixed. The computer has been in constant use today and not much by me. Hence the lateness of this post. Man, I miss my laptop connection. First, you'll have to register here. Then, you'll be able to talk to the authors of The Shape of Love. There will be giveaways, including ebooks - so take a few minutes and click over to talk to us! Again, it'll be a first for me! Don't worry - I'll remind you before then. We're supposed to actually get some winter weather. That's all I'm sayin'. Don't want to jinx it or anything. The weekend was long, busy, but good. We had to take a relatively long drive yesterday to pick K2 up from a weekend thing she had. The weather was not so good - blowing snow and really high winds. We took B's moms car since my Suburban is in dire need of new tires (next week), and that little car was pushed all over the highway. And, of course, the exit we needed to get off of was drifted shut, leaving us to sit on the highway for quite a while. We were about a mile from the gas station we planned to stop at for a potty break - and guess who really, really had to go? I considered walking, but the wind pretty much talked me out of that one. I also considered hiking into the shrubs alongside the highway, but the bright daylight and evil wind were factors. We finally made it, and made it home with no huge issues (though traffic, blowing snow, and black ice all factored in). It's brutally cold here, but the dog doesn't want to stay inside. She'd rather go out and bark at the wind, which is driving me pretty much nuts. Our poor totem pole fell down with the wind, too. I don't think I've ever posted a picture of that. I'll have to see if I have one. Not as much as I thought I would be, but considering how much else was going on around here last night and this morning, I think I didn't have time to be nervous. Plus, it snowed this morning, which never bodes well for events people have to travel for. But...it went very well. We sold some books and had an absolute blast. The folks at One Good Woman are wonderful! They were so accomodating and friendly, and excited we were there. One Good Woman is an awesome store! I loved it, and can definitely see myself going back for cool stuff. The place was packed for a time, and when it wasn't there was still a steady stream of customers. The hours went by fast! My mom and her friend came out, which was wonderful. And my sister traveled quite a distance to come out, which meant more to me than I can say. So, my first signing was a completely positive experience. On the homefront, K3 called me during the signing to tell me he took First Place in the entire race! Pretty cool especially since this is his last year as a cub scout. They had a 'family and friends' division this year, and K4 won that! Of course, there are no pictures because while B and I had discussed who was taking the camera, neither of us did. The fabulous Misty and Vicky B - yep, all three authors in The Shape of Love, will be there. Along with the equally fabulous Jacki King. Come out and visit us! It's my very first book signing, plus I'm missing K3's last Cub Scout Pinewood derby race to sign books! So, please come out and see us! Today I got to hand Vicky B her very first print book. She's multi-published in electronic format, but this is the first time she's gotten to hold a paper book in her hands with her name on it! It was very exciting - almost as exciting as when Misty handed me my book! We signed pre-ordered books, laughed, talked, ate, brainstormed, and actually worked on our own writing while listening to K1 snore on the couch. (don't ask) And my mom stopped by, bringing us each a rose, and getting the first copy of the book signed by all three of us. In the near future, there will be an author chat featuring the three of us at Draumr. I'll keep you posted with the details. It'll be my first one! Another new Supernatural is on tonight! I can't wait!! 2. I don't like those big woodpeckers. At all. 3. I can't sing. Well, I can, but you definitely don't want me to. Okay, I'm supposed to tag 6 people, but I'm not going to do that. If you feel like doing it, go ahead, then let me know you did it! In my hot little hands, baby!!! The Shape of Love is now available! In fact, the author copies are on their way...and I'm having a hard time concentrating on anything else! In a few short hours, I will be holding my very first published work in my hands! WHOOT!!! 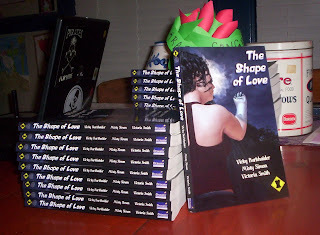 The Shape of Love is available at Draumr Publishing and Amazon.com. Unless you know me, then I'll have your copy soon! The cover's too the left. What the book is about...just in case you forgot!! Who's To Say What Shape Is Normal...Join three voluptous women as they open their hearts and minds to possibilities beyond the normal...and straight into the paranormal. Sunny Clark always thought she was the only shape shifter in the town where she grew up. But when she returns for her high school reunion, she is shocked to find that nearly the whole town can turn into one thing or another. Including her teen crush, David Maxwell. After a challenge for position in the pack, where Sunny defeats the town's Alpha female, the real question becomes does David only want the new Alpha female, or has he always wanted Sunny just as she is? Sarah James' quiet, almost solitary life changes when she rescues a wet, bedraggled cat out of a raging storm. But he always seems to disappear without explanation, only to return at the oddest times. Is he really lost, or does he have a secret life outside her apartment walls? Trenton Cutlass has been forced to roam ever since he was cursed into the form of a fat, tabby cat after dusk. No one has ever taken him in...until Sarah. 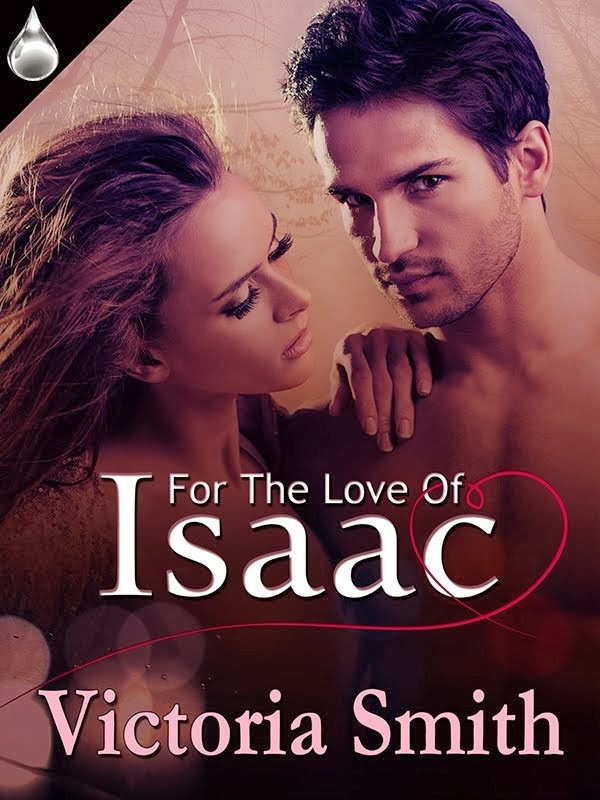 Suddenly, breaking the curse is more important than ever, or he'll have to abandon the lovely Sarah forever. Drugged and lost after escaping a deranged kidnapper, Dane Masters is stuck as his hereditary alternate form. While wandering the streets on four wobbly paws, he's taken in by vet tech Izzy Burnett. 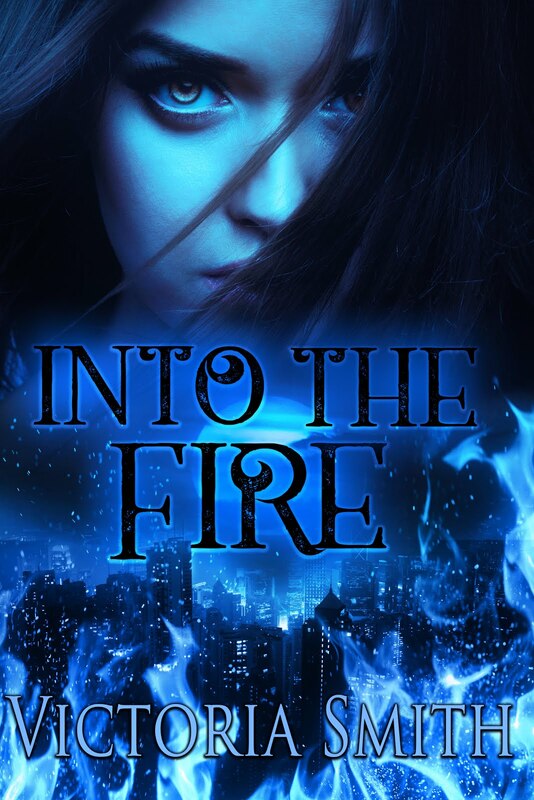 Once he has regained his strength, and his memories, Dane realizes he has found his predestined mate. 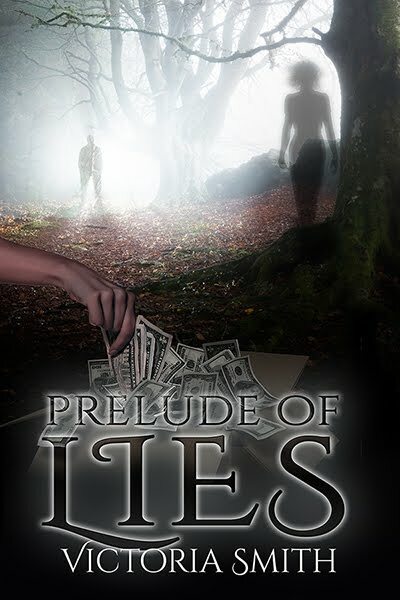 But will he have time to convince Izzy before the kidnapper turns killer? I've got one home today...flu-like symptoms, though it's too early to tell if she really has the flu or if something else is going on. Except she was with children who'd been/were sick. Which is not a big deal considering everyone at her school is coming down with the same thing. We'll see. All I know is that when I called her for school this morning, the response I got zoomed past my B.S. meter without a second thought. Well, that and the fever she's running. She's one that frequently attempts to yank my chain, though this will only be the second day of school she's missed this school year. My B.S. meter is fairly well-honed thanks to K1. Our night ended a little later than I would have liked, and now I'm dealing with the after-effects and K2. She's late - woke up late and ohsovery cranky. And, thanks to that, I've had to request favors of time, traffic frustration, and gas to get her to her arts school. None of which would be a problem if K4 wasn't feeling so yucky. And K3's clock is set wrong. He woke me an hour before my alarm was due to go off to tell me we were probably late. Then, he continued to come and harass me about the time every few minutes. Not in a rude way, just in a worried we were late way. Then, he realized his clock was wrong. My day hasn't started off very well. Today is B's birthday. No, I'm not going to tell you how old he is. We're not doing much this evening. Our usual Monday obligations will pretty much prevent that (if he doesn't get stuck at work). He's not a big fan of his birthday. Never has been, and I've been with him for at least three-fourths of his total birthdays. It's always been the same. I say "happy birthday", and he says "whatever". Though this morning he didn't. I think he felt sorry for me because of all the crap I'd already dealt with. I gotta admit, I'm not too into the Superbowl game (no throwing tomatoes). We are going to a party later, but more to see friends we haven't seen in ages than to root for any particular team. Though, since I don't follow football I'll be rooting for Natalie's team for her. And no, I'm not saying people shouldn't care about the Superbowl - just that I'm usually pretty flat about it. The Shape of Love will be available pretty darn soon. Trust me, you'll know when. Holy cow, it's February already! It went fast, and wasn't a terrible, awful month. Of course, it wasn't a fantastical month either. But whatever. The new Internet installation went well, but wasn't without some irritations. I now cannot get onto the Internet with my laptop - at least not yet. Apparently, I need some kind of network hub, or other thingy that I can't remember the name of. (which I had no idea about, despite asking the guy 3 times and being assured nothing would change) (Imagine my irritation - you already know how I feel about not having Internet. Not that I didn't, but I couldn't do what I wanted to do.) And, the virus protection that came free with the service is only good for one machine - which means I'll have to come up with something else. Anyway. There were a few other snafu's, but nothing major and all is well now. Can't say I think it's any faster, but that's probably due to the ancient computer than the actual service. The boys are back, and oh my goodness Sammy is starting to grow up. Lots of door kicking and toughness...oh my. I love the toughness, and yet, I still love the emo Sammy. And Dean...oh Dean. The teeth falling out of the woman's mouth grossed me out, but not as much as the maggots got to K2. She had to leave the room. Well, for that and because she said I was making too much noise. Next week is another new episode with another of my favorite characters, Bobby. I can't wait. We've got freezing rain here. School was delayed this morning, but luckily, my plans for the day weren't significantly altered. It's really cold, and drainage is poor pretty much everywhere - which meant we had to try (note I said try) to jump a very large puddle in front of the school. Actually, several large puddles. Now I have to go. Emergency call from K2 to save her from walking home the frozen downpour.